I remember those things. I guess this means we are both old huh? I don't remember them. I Know I'm old enough :) but I don't remember them at all! Hellooooooo, Ally!!! Bet I've got some of those in a shoebox, in the closet. LOL! Oh, I love anything Pac Man or 1980's arcade for that matter! There was tons of Pac Man merch out there. I have never seen these though. It seems like a good way to get kids hooked on lotto scratchers! I just adore your blog. :) I used to love playing pac man as a kid, but I don't remember these cards. I must have been to young. I was born in 1983. Haha. 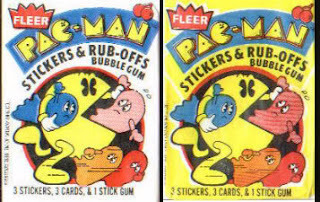 While I had all things PacMan, I don't think I ever had these. 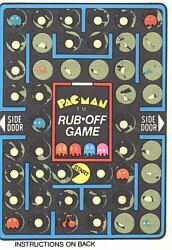 I still have two of the pac man rub off games, that have never been rubbed off.